9/8/2016 | Scented Splendor: The art of TAMURA Keisei — dai ichi arts, Ltd. It's no wonder that Steve Jobs couldn't get enough of Japan. Sony's Walkman inspired him to make the iPod, just one of many Japanese things that have sharpened artistic sense and inspired creativity worldwide. The Japanese have it! Here, we have a smartphone-sized incense burner, decorated with distinctive Kutani colors: purple, green, and mustard yellow. The highly refined background pattern has origins in textile design, and the piece features extraordinary micro-calligraphy - small enough to fit on a grain of rice! The art of brush-writing micro-calligraphy on ceramics developed as a feature unique to Kutani wares. This art requires great skill and intense practice, and has been passed down for over a century from its founder, Oda Seizan 小田清山, to his descendants Tamura Kinsei 田村金星. 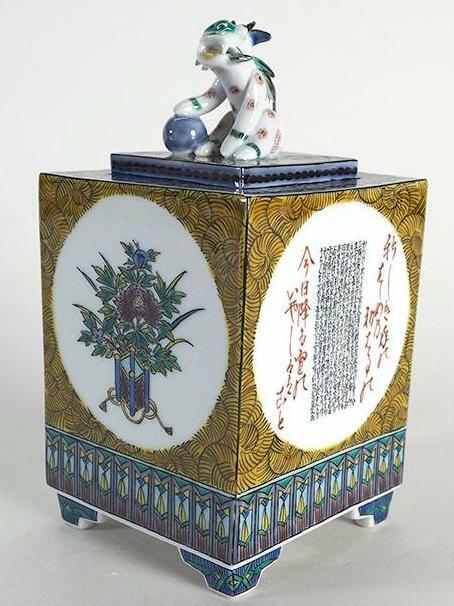 First pioneered in the early Meiji Period of the late 19th century, early examples of this technique featured classical Chinese poems brushed inside of tea and sake cups. The art of micro-calligraphy grew out of the immense skill of painters during this period who created highly sophisticated and detailed compositions. After many years of devoted and diligent practice in the development of micro-calligraphy, Seizan Oda began writing inside of teacups in 1884. By 1900 he had begun writing classical Japanese poems in Japanese characters, bringing this art to near perfection. He further demonstrated his unparalleled skill in the early 20th century, writing all 100 of the Hyakunin-Isshu poems inside of a Western cup a mere three centimeters in diameter. He also wrote 500 of Emperor Meiji's Waka poems inside of a Japanese teacup. These miraculous achievements of micro-calligraphy earned him the reputation of having "the hands of a god." This exacting art was passed from Seizan to his son-in-law Kinsei Tamura, whose artistic talents became rapidly apparent. His inherent calligraphic skill together with his inventor's spirit led him to create the first combination of micro-calligraphy and traditional Kutani paintings. Here, in the work of Kinsei Tamura's grandson Tamura Keisei, we see the evolution of the art form over the decades. One incense burner features a selection from 万葉集 "Collection of Ten Thousand Leaves", one of the oldest existing Japanese poetry collections. The lid is graced by a traditional Kutani duck, equal parts refinement and fun. Another is topped by a cunning lion and painted with a selection from 古今集"Collection of Ancient and Modern Japanese Poetry." This text is an early anthology of the Waka form of Japanese poetry, dating from the Heian period. These two gorgeous incense burners marry tradition with innovation, meant to delight to both the senses and the intellect. Before Tamura Keisei, characters had never been integrated into the paintings applied to Kutani wares, but rather only written on the blank inner spaces. Tamura raised the importance of the characters to be on par with the other decorations, creating well-balanced, sophisticated works of art that capture the highest form of this genre. On both of these two works, a beautiful all-over patterning surrounds large white windows on each side. Two sides reveal sensitive floral paintings, while the other two feature the precisely applied poems. Integrated by form and pattern, these poems and paintings are given equal consideration and weight. They come together to create a stimulating and unified whole. Tamura has met wide success with these calligraphic Kutani works. Born in 1949 in Kanazawa, he studied the family art of micro-calligraphy with his grandfather, Tamura Kinsei, beginning in 1969. Since then, his works have entered several public and private collections, including the Arthur M. Sackler Gallery, the Ishikawa Prefectural Museum of Art, the Nomi Kutani Ceramic Museum, and the Kanazawa Nakamura Memorial Museum. In 2005, he was designated an Intangible Cultural Property by the Ishikawa Prefecture for his innovative and integrative approach to ceramics and calligraphy. he precise art of brush-writing micro-calligraphy has been handed down through four generations of this family, from each father to one child. Tamura has a daughter, Seito, who will bear the torch of this art for future generations. Both Tamura and Seito are committed to further enhancing their skills and to continue to portray the elegance of Japanese classical literature in a contemporary setting. Come visit us to see these jaw-dropping, extraordinary art pieces!